The Other McCain: Bizarre news from Washington, D.C.
Will the Obama dynasty fall if the ravens leave. 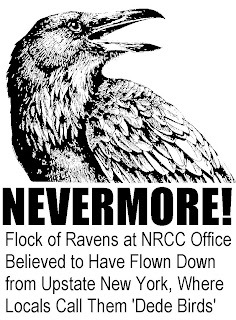 Why can't they croak, ''Nevermore' like the rest of us ? Disgusting behavior by Owens, but this will help Hoffman at the next election. Bill Ownens' Otter Moment. Except all of us are the insurance company getting scammed on this one. And don't feel too bad, that fat Scuzzy-Wuzz-She would have done the same. Blaming a snake for biting you (even a big fat diseased one that smells bad) misses the point, blame the GOP leaders and Newt bringing this snake to the party.